One of the difficulties of the English language is to know whether to use a gerund (ex: doing) or an infinitive (ex: to do). 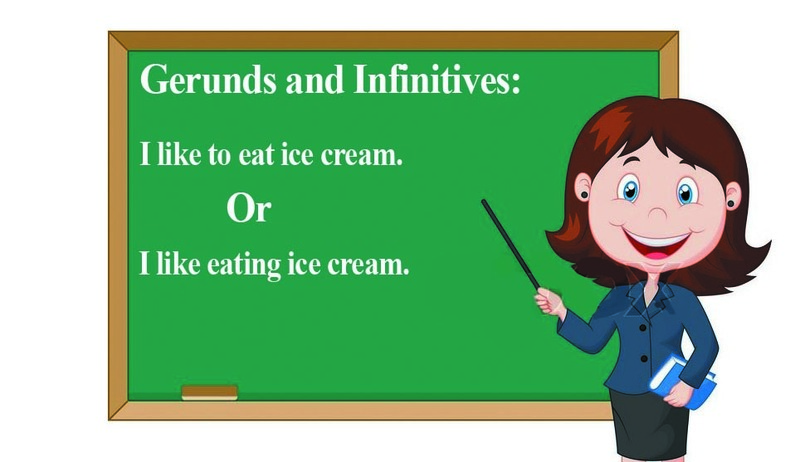 In the article below I cover gerunds and infinitives exercise with answers, but initially, I recommend you to take look at rules for using gerunds and infinitives or when to use gerunds and when to use infinitives before doing the exercises. Exercise 1: Choose the correct option. Dan enjoys (reading/to read)science fiction. 2. Cheryl suggested (to see/seeing)a movie after work. 3. I miss (to work/working) in the travel industry. Maybe I can get my old job back. 4. Where did you learn (speaking/to speak) Spanish? Was it in Spain or in Latin America? 5. Do you mind (to help/helping) me translate this letter? 6. He asked (talking/to talk) to the store manager. 7. You’ve never mentioned (to live/living) in Japan before. How long did you live there? 8. If he keeps (coming/to come) to work late, he’s going to get fired! 9. Debbie plans (to study/studying) abroad next year. 10. I agreed (helping/to help) Jack wash his car. Exercise 2: Choose the correct option. I can’t stand (complaining/to complain/her complaining)all the time. 2. Our teacher won’t allow (to use/us to use/us using)dictionaries during the test. 3. We advised (him to take/him taking/his to take) a taxi instead of walking to the restaurant. 4. The city doesn’t allow (to park/me park/parking) along curbs painted red. 5. She prefers (my making/me to make/making) dinner because she doesn’t like to cook. 6. I hope you don’t mind (my smoking/me to smoke/smoking) while you eat. 7. John is never on time to work! I hate (arriving/him to arrive/his arriving) late every day. 8. Sarah urged (to vote/me to vote/me voting) in the next election. 9. He needs to get a visa extension immediately. The authorities won’t permit (him to stay/him staying/to stay) in the country without a visa. 10. Travel agents usually advise (to reconfirm/him reconfirming/reconfirming) flight bookings three days before departure. Exercise 3: Choose the correct option. Neil is starting (to learn/learning/<to learn/learning>)Japanese. 2. Neil started (learning/<to learn/learning>/to learn)Japanese when he moved to Tokyo. 3. Samantha loves (to live/<living/to live>/living) New York. She has been living there all her life. 4. I would love (to live/living/<to live/living>) in London, but it is too expensive. 5. Tom loves (<to live/living>/to live/living) in smaller towns where he can get to know the locals. He would never live in a big city. 6. Fred is continuing (to take/<taking/to take>/taking) karate lessons even though he broke his hand. 7. Fred continued (<to take/taking>/taking/to take) karate lessons even though he broke his hand. 8. I like (eating/to eat/<eating/to eat>) pizza. 9. I would like (to travel/traveling/<to travel/traveling>) back in time and meet my great grandparents. 10. It’s so hot in here! I’d like (<being/to be>/to be/being) sitting in my swimming pool right now.